Main findings: Jatropha does suffer from pests. In Manica Province the Yellow Flee Beetle can be devastating. The more common Golden Flee Beetle found at many sites in Mozambique and other countries rarely kill the Jatropha plants. Before the FACT/ADPP project started a few NGOs and individual farmers had planted Jatropha the Manica Province. In particular Caritas was active and many of the farmers they worked with established small plots of Jatropha. It was easy to establish the plants and the farmers were hopeful. That a few international traders visited the area looking for Jatropha seeds just increased the optimism. However, around 2004 it became obvious that things were not going well. Many plants were looking miserable and dying. Within a short time many farmers lost all their Jatropha plants. Flemming Nielsen undertook a small field survey and found that a yellow flee beetle was the culprit. Insects were sampled and macro photos made. Entomologists in Mozambique and internationally were contacted but nobody were able to fully identify the flee beetle or offer any advice on its impact or control. Outside Manica Province the golden flee beetle was observed. It caused some damage but did not appear to kill the Jatropha plants like the yellow one did. 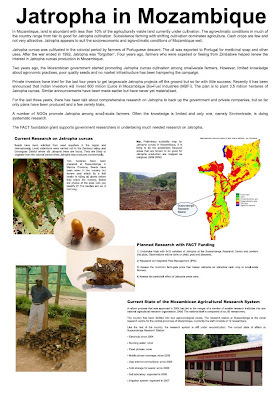 In 2007 a poster presentation was prepared for a scientific conference on Jatropha in Wageningen. It was hoped that some of the assembled experts would be able to identify the flee beetle and provide more information. That was however not the case but it appeared that Jatropha elsewhere in Africa was also being attacked by the flee beetle. In all cases it was the golden flee beetle. From communication with people throughout Africa we now know that the golden flee beetle is a common pest on Jatropha in the Southern and Eastern parts of the continent. Only from Zambia have I seen photos of yellow flee beetles. On the old Jatropha plants (15+ years) large numbers of Rainbow Shield Bug (Calidea dregii) was observed. They are known as a pest of cotton but also breeds on sunflower, sorghum, tobacco, castor oil and other crops. They feed by piercing young seeds, causing seed shedding. We observed them sitting on green and yellow seeds of Jatropha curcas as well as inside dried seed pods. Further studies will be required to establish what damage they cause in Jatropha. In cotton the pesticide Permethrin is used to kill Green Shield Bug. Pest damage was most severe in areas that showed signs of low soil fertility. Managing soil fertility may therefore be an important means of keeping the prest damage down. In the research nursery outside Sussundenga a severe attack by yellow flee beetle in 2007 showed how devastating they can be. Whole batches of Jatropha curcas seedlings were wiped out by the beetle as can be seen below.